Our home is a nature lover's paradise. We are located on 160 acres of field and woods in one of the most beautiful parts of Netley Creek in the Manitoba Interlake area. Our cedar home has an entire "South Wing" set aside for guests to relax and enjoy our facilities. It includes a sitting room with TV and PC with internet access and reading materials to relax and enjoy. Or join us in our beautiful A-Frame living room which overlooks Netley Creek. 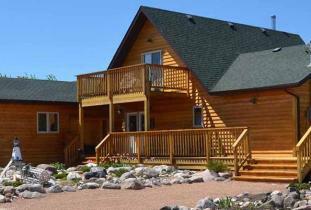 We offer a spacious and quiet setting to enjoy nature walks, birding, skiing, and other outdoor experiences. We are located 30 minutes north of the Perimeter highway on Highway 7, and five minutes north of Teulon (at NorthWest corner of 99N and 11E). We are minutes away from many of the best Interlake attractions including the Teulon Golf and Country Club (5minutes)., Narcisse Snake Pits (20 minutes), Winnipeg Beach (20 minutes), Oak Hammock Marsh (25 minutes), and Gimli (25 minutes).